Murruwaygu is a Wiradjuri word referring to the unique south-east designs that are carved onto trees and weapons. ‘Murru’ means ‘nose’ and is often used to denote something ahead of you, while ‘murruway’ means ‘track’ or ‘path of footprints’. The compound word ‘murruwaygu’ entwines these meanings, imparting a sense of following the tracks of those who have gone before us. The exhibition Murrwaygu: following in the footsteps of the ancestors (Art Gallery of NSW, 28 November 2015 – 21 February 2016) considers the continuing use of the line by four generations of male artists from south-east Australia, from pre-contact times to the present day. A distinctive use of the line is constant in figurative and abstract imagery, in varying mediums, and through changing social, political and cultural climates, representing the unbroken lineage of Koori knowledge and culture. By bringing together four generations of Koori artists, Murruwaygu begins to tell the story of south-east Australia, a region rich in cultural traditions. Each generation is heir to the cultural leaders before them, and collectively we are following in the footsteps of our ancestors – murruwaygu. The four generations begin with shields, representing classical Koori or pre-contact material, which are the foundation of men’s work. The examples on display were collected in the 1800s and early 1900s, mostly without the artist’s name being recorded. The marga or parrying shield and the manggaan or broad shield are two types of shields unique to south-east Australia. Both are carved from wood and are often highly decorated works of beauty. The term ‘broad’ refers to the flat face of the shield. They are sometimes called ‘spear’ shields as they are understood to have been used to deflect spears. South-east broad shields are created using two techniques: worked from the inner bark of a tree or carved from a solid piece of wood. The former involves cutting the bark off a tree, paring it down and shaping it, then adding a cane handle; the latter is made with a single piece of wood that has the handle cut into it. Parrying shields are solid and narrow to parry, or ward off, blows from clubs. Cut from a single piece of wood, these shields often have three or four sides with incised front-facing designs. Their use is seen in the work Ceremony c1880s by William Barak (reproduced below), who captures the unmistakable form of the parrying shield in a scene involving two men in close combat, each with a club in one hand and a parrying shield in the other, under the watchful eyes of the elders. The skill and time involved in creating shields indicates their cultural importance. Engraved with myriad lines, south-east shields best exemplify the region’s artistic cultural practice. Like parrying shields, broad shields are often cloaked in an array of diamonds, zigzags, squares, bands, circles, criss-crosses and the occasional figure. These iconic designs empower the shield bearer by representing country and identifying both regional and clan affiliations. As seen in the imagery of both William Barak and Tommy McRae, broad and parrying shields played a central role in south-east ceremonies. Shields used in performance would often be painted with natural pigments, remnants of which can still be seen on many today. 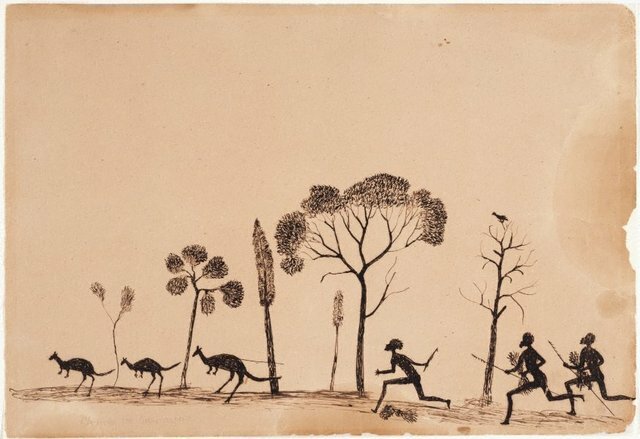 The next generation profiles the 19th-century Koori master artists Tommy McRae and William Barak; both were working on the frontier while maintaining their use of the line in the introduced materials of ink on paper to recall the world they knew as young men. Tommy McRae (c1835–1901) lived and worked on the central Murray River border between NSW and Victoria near the present-day towns of Corowa and Wahgunyah. 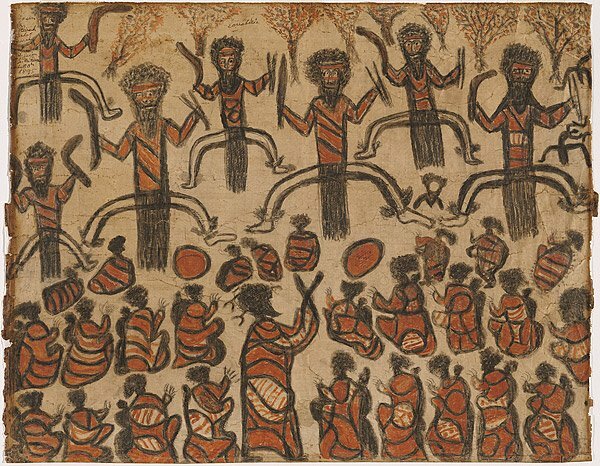 It is understood that McRae’s traditional name was Yackaduna, appearing on drawings held in the collection of the State Library of NSW, and that he belonged to the Kwat Kwat clan. McRae witnessed the dispossession of Wiradjuri and Yorta Yorta country through the impact of the 1880s gold rush and the development of the pastoral industry. McRae had a traditional upbringing. Adapting his knowledge of country, he gained a reputation as a stockman and worked throughout the region. He was a fiercely independent man and a renowned teetotaller. At Lake Moodemere he established a camp for his extended family where he generated an income selling chicken and fish, making shields, boomerangs and possum-skin cloaks, and from his pen-and-ink drawings. Despite his success, McRae, like most Aboriginal people of the time, was victim to the policies of the day and his children were taken away by the authorities. Working mainly with pen and ink in sketchbooks, McRae offers a rare insight into the dramatically changing world of the mid to late 1800s. Dominated by scenes of ceremony, fighting and hunting, McRae’s images are reflective, recalling a past for future generations. Small lines are built up to create minimal works that are alive with movement, humour and detail. His silhouette style achieves a balance of positive and negative, which can be understood as an extension of his practice of creating carved objects such as parrying shields. William Barak (c1824–1903) was a Wurundjeri man of the Woiwurrung nation, whose lands include present-day Melbourne. As a young boy he remembers the first incursion on Woiwurrung country. This took place in 1835 when John Batman of the Port Phillip Association claimed land via a so-called treaty with local clan leaders including Barak’s father, Bebejern. After colonisation Barak was schooled at a mission school, and in 1844 he was recruited into the Native Police where he was given the name William. Barak, along with his cousin Simon Wonga, led the 1863 establishment of Coranderrk Aboriginal Station on the junction of the Yarra River and Badger Creek, near what’s known today as Healesville in Woiwurrung country. Here, Barak assumed the role of Ngurungaeta (leader) of the community, started a family and fought relentlessly for the rights of his people. Barak worked closely with the amateur anthropologist Alfred William Howitt, who appropriated much of Barak’s knowledge in his 1904 publication The native tribes of south-east Australia. Barak is best known for the paintings he made at Coranderrk from the 1880s onwards. His works engage a strong use of line, infilled with blocks of colour often from natural pigments. His paintings record the world he knew before invasion, where festive ceremonial scenes show a landscape crowded with his kin. Barak’s figures are often clad in possum-skin cloaks, and both human and animal figures are adorned with distinctive designs and patterns, such as those seen on shields and other objects. The third generation focuses on self-taught senior Koori artists Roy Kennedy and the late HJ Wedge, who both grew up in harsh conditions on missions in New South Wales under strict government-segregation policies and use the line in their printmaking and painting to tell stories. Roy Kennedy (b1934) was brought up at Police Paddock Mission at Darlington Point, near Griffith, NSW, on the banks of the Murrumbidgee River. Police Paddock Mission was created when Warangesda Mission, established in 1880 and one of the earliest in NSW, was shut down in 1925. It was here that Kennedy’s mother was born and later taken away to Cootamundra Domestic Training Home for Aboriginal Girls. Warangesda was an important refuge for Wiradjuri people and when it closed many were forced to establish or join other communities around the state. Kennedy’s family and others, however, stayed in Darlington Point. In 1940 the Aborigines Protection Board shifted policy and Aboriginal missions were shut down or disbanded. Aboriginal families struggled to survive, working seasonal jobs, and Kennedy eventually moved across the country in a range of employment, including working on the railways. He finally settled in the community of Redfern, where, in 1995, he enrolled at the Eora Centre TAFE (Technical and Further Education). Here he started drawing, painting and printmaking. Through his work Kennedy looks exclusively at his family’s two missions, Warangesda and Police Paddock, constantly reciting these subjects. He depicts the regimented mission houses with their outhouses, the authoritarian institutions of the church and the police station, and rambling fences that delineate and symbolise mission life, often set against the bank of the meandering Murrumbidgee River. As an etcher, Kennedy scores into metal plates and his works recall the traditional carving practices of his ancestors. Lines intertwine across the paper to create Kennedy’s distinctive black-and-white vignettes of his childhood. HJ Wedge (1957–2012) was born on Erambie Mission outside Cowra, NSW, in his Wiradjuri country, and lived there most of his life. As a young boy he suffered from a disability that impeded his movement, perhaps giving him a unique perspective on the world around him. As a mature-aged student, he studied at the Eora Centre TAFE (Technical and Further Education) in Redfern, where he developed his distinctive style of painting. Wedge was quickly recognised and became a central figure in the establishment of both the Koori art and urban art movement, playing a key role at Boomalli Aboriginal Artists Co-operative, Sydney. By creating historical analogies, dramatising contemporary incidents and transcribing his dreams, Wedge travelled back in time, mining the past through images in books, on the news and in documentaries. His works, such as the 1993 Stop and think series, present an Aboriginal history and comment on everyday life. 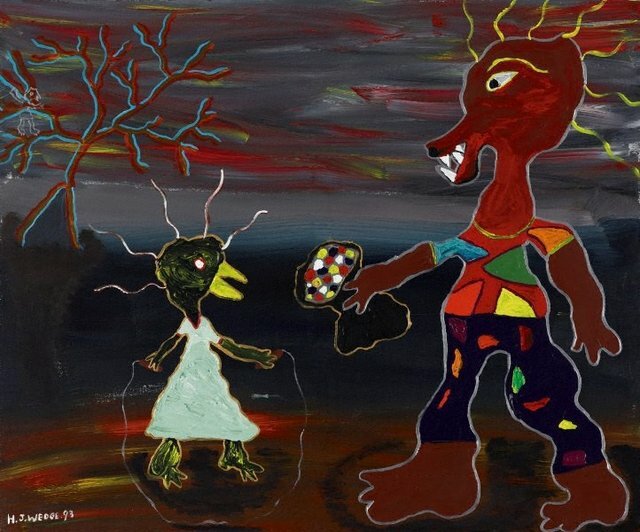 Here Wedge combines a surreal landscape with elements of the Little Red Riding Hood fairytale to raise awareness of the kidnapping of Aboriginal children, showing the Big Bad Wolf attempting to abduct a young girl represented by the emu. Wedge relied heavily on intense outlines, which he created by first scoring the canvas using a blunt pencil and over-painting with discordant colours. His use of line often captures the emotive energy of his subject – radiating lines express a sense of anger and despair but also awareness of cultural connection. The fourth generation in the exhibition features the contemporary Koori artists Reko Rennie and Steaphan Paton, who work with new mediums while continuing line traditions. Reko Rennie (b1974) was raised in the inner western suburbs of Melbourne and first started creating work on the street as a teenage graffiti artist. Informed by both 1980s American culture and by his Kamilaroi heritage, Rennie refined his skill on the buildings, trams and laneways of Melbourne. Mastering the use of spray-paint and stencils to create his artworks, he converted his approach to work within the gallery context, often on boards, canvas and directly onto the gallery wall. By bringing the traditions of the streetscape into the context of the gallery, Rennie raises the reality and visibility of an urban Aboriginal identity. Drawing on political and historical Indigenous narratives, Rennie uses a suite of signature designs. Central to his visual vocabulary is the radiating equal-sided diamond, which refers to the dendroglyphs, or carved trees, that traditionally marked Kamilaroi country. Made by cutting a section of bark from a tree to reveal its hardwood, then carving the lineal design, carved trees were made to signpost country, including marking graves, ceremonial grounds and important sites throughout northern and central NSW. Through his father, Rennie has inherited the knowledge of and rights to these designs, which he combines with his own personal trio of tags – the crown, the diamond and the Aboriginal flag ‒ each applied en masse. These graphic elements come together to not only reference the traditional geometric patterning of the south-east, but to highlight the region’s resilience, ongoing connection and sovereignty. Rennie actively promotes his unique south-east cultural position and vision through his innovative art practice. Steaphan Paton (b1985) comes from the Gunai nation of the Gippsland region in eastern Victoria, a site known for its colonial conflict. The dispossessed Gunai were corralled onto missions, where many continued their traditional practices, often underground or within new contexts, such as producing baskets and boomerangs for the tourist market. Born in Melbourne, Paton comes from a long line of artists and trained under the direction of his late grandfather and recognised community leader, Albert Mullett. Paton is strongly grounded in his cultural identity. He continues the tradition of carving taught to him by his grandfather, while working with paper, film and installations to tell new stories in new contexts. In his work Cloaked combat 2013, the ongoing issue of conflict is central. Incised with diamond designs representing the five confederate Gunai clans, five broad shields are pierced with carbon-fibre hunting arrows and hung like colonial trophies. The work directly quotes the famous image of Muhammad Ali on the cover of Esquire magazine in 1968, and the 2010 re-enactment by Aboriginal boxer Anthony Mundine, where both men assumed the role of the Christian martyr Saint Sebastian. In this way Paton not only references the African-American civil rights movement, but the popular imagery of martyrdom. In the films of the same title, Paton himself is dressed in camouflage, shooting at the shields. Paton’s shields and their designs embody the Gunai people and the assault on their country and Aboriginal Australia at large, but more importantly they represent the continued resistance of Aboriginal people in defence of their country, culture and community.